According to Union Budget 2017-18, Centre expects to see one million farm ponds being built by March 2017. If the government continues to chase unprecedented targets, it might turn into an exercise in vain. The centre and state governments have set an unprecedented target to fight drought this year. It has been decided that 2 million farm ponds will be dug across the country before the end of the year. Farm ponds are small tanks, usually occupying a part of the farmland, to store rainwater for irrigation. In April, the Centre decided to construct farm ponds on priority under the Mahatma Gandhi National Rural Employment Guarantee Act (MGNREGA), following which the states submitted their own targets and programmes. In most states, the construction started in the middle of the monsoon and the rain caused heavy damage to ponds, making farmers and experts question the idea and the breakneck speed at which the work was being carried out. Khukhra panchayat in Ranchi district of Jharkhand is one such example. In May, Jatru Oraon, head of the panchayat, was helping village residents fight drought. 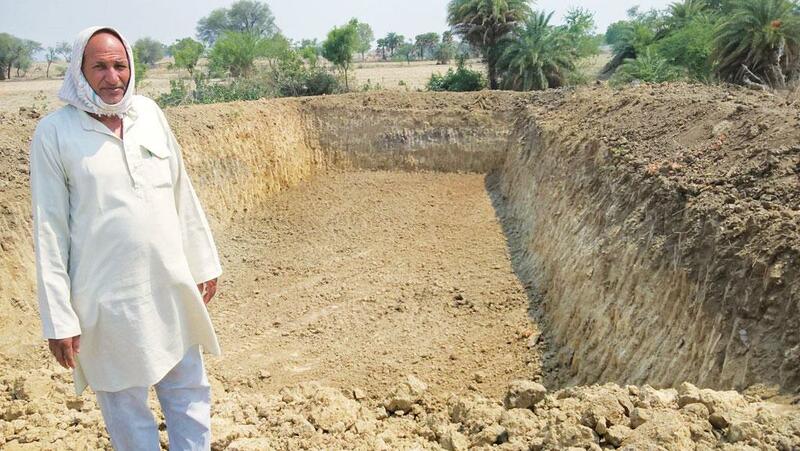 When the government decided to build farm ponds, he championed the cause. But after three months of monsoon, Oraon has another challenge. “The flood has submerged all the farms; many ponds are damaged. I am not sure how many structures will emerge unscathed once the water recedes,” he says. Facing a severe drought in April, the Jharkhand government set a target of digging 100,000 farm ponds by June 10—the official date of the arrival of monsoon in the state—and another 50,000 by the end of the year. Despite the mad rush to build ponds, the government could not meet even 35 per cent of the target by mid-June. Even during the rains, instead of stopping work, as is the usual practice, the government put pressure on officials to meet the target. Media reports say several farm ponds have collapsed due to poor design and over 30 people have drowned in these structures between June and September. Rajesh Lohra of Nihalu Bhartali village in Ranchi, lost his six-year-old son when a pond collapsed. “This is worse than drought. Officials are mindlessly digging ponds and the excavated soil is heaped next to the structure. Children account for the maximum casualties,” says Vinay Mahato, member of Ranchi-based non-profit Jagriti Vikas Foundation that works on issues concerning child rights. The officials even allowed the use of heavy earth movers to dig the ponds, which is against the rules of MGNREGA. They forced farmers to build ponds on topographically unsuitable areas. Most of the ponds dug on hilly slopes have been washed away. “We lost a part of our farm and with it the hope to harvest water,” says Oraon. Though he did pursue people to allow the construction of these structures, he accepts that farm ponds do not work in the area because the terrain is rugged. He says officials did not pay heed to his demand to dig more wells in the village. Karnataka and Andhra Pradesh, the two states that account for half of the total target, also received heavy rains and there were media reports of widespread damage to ponds. Officials from these states, however, have refused to comment on the extent of damage. “Once the monsoon is over, we will compare the rate of construction of ponds before, during and after the monsoon to know the exact impact,” says an Andhra Pradesh government official on condition of anonymity. A Karnataka government official says there was some “minor” damage reported from the northern districts of the state. Chandra Sekhar Masaguppi, joint director, Rural Development and Panchayati Raj Department, Karnataka, blames the Centre for making the states undertake this Herculean task. “Other structures, like check dams, are not being built at the usual pace,’’ he says. A K Sumbly, deputy secretary, MGNREGA cell under the Union Ministry of Rural Development, however, says that the Centre has not given any instruction and the states themselves have been making tall claims about their capacity to build ponds. However, the widespread damage has even made government officials raise an alarm. “The government allowed digging during the monsoon, neglecting the fact that many of the ponds were destroyed during construction,” says Chandra Bhushan Tiwari, district planning officer, Ranchi. Moreover, the labourers whose names were not in the official muster roll of MGNREGA, but who were deployed by the state government in its rush to meet the target with the assurance that they would be remunerated, are now demanding payment of their wages. 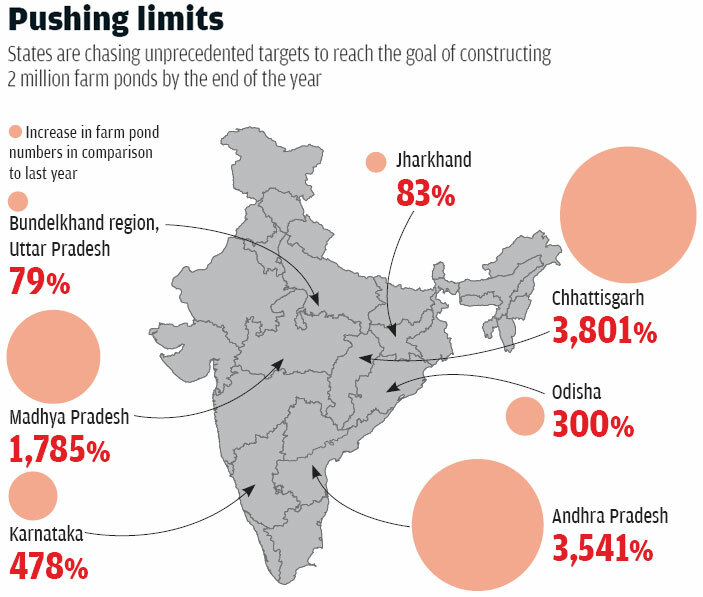 The rush to build farm ponds was triggered by the drought in 16 states of the country this year. As reports of drought in Maharashtra started playing out on television channels, one state after another announced programmes to dig farm ponds. Finally, the Central government declared that farm ponds would be the priority under MGNREGA. Sumbly says that the target under MGNREGA is 1.2 million farm ponds. In addition to this, the states have declared their own targets, taking the total figure to 2 million. Andhra Pradesh tops the list with a target of 0.65 million ponds this financial year. This is 40 times the target the state had last year. In Madhya Pradesh, this is the first time a target has been set under MGNREGA, says Mahindra Kumar Jain, superintendant engineer of MGNREGA in the state. The Centre has given the state a target of 50,000 ponds but, according to Jain, the state has decided to build 76,000 ponds. MGNREGA faces serious criticism over the quality of more than 8 million water structures that have been constructed under the Act in the past decade. Close to 40 per cent of these structures are not even complete. The latest spree may just aggravate the problem. Experts say this not only impacts the drought-proofing programme of the country, but also discourages communities from getting involved, which is crucial for the success of such initiatives. Moreover, the government’s move to set targets under MGNREGA undermines the Act which allows panchayats to set their own goals. For Prem S Vashistha, economist and senior fellow at the National Council of Applied Economic Research, New Delhi, it is a concern for the very sustainability of MGNREGA. When a government sets a target, communities do not get to decide on what is most suitable for them. “If the communities are not involved, then the projects under MGNREGA will not be sustainable,” he says. Jharkhand’s experience of chasing targets also indicates this. In 2011, the state undertook an initiative to dig wells, just the way it embarked on digging farm ponds this year. Most of the wells collapsed due to bad design and location, and communities in several areas boycotted the programme. A Vaidyanathan, hydrologist and member of the erstwhile Planning Commission, says that the ponds are rainfed and it is unclear how they will be of help in drought-affected areas. He adds that there is no database to track the effectiveness of these ponds in comparison to other water conservation structures. For instance, the best option for irrigation in Madhya Pradesh, which is a plateau area, is open dug wells, says Jain. Farmers in the state say that ponds cannot store enough water. In many states, farmers are unclear about the wages they are entitled to under these initiatives. While they receive a designated daily wage for their work on farm ponds under MGNREGA, for state programmes they are being asked to share the cost. In Jharkhand, for instance, the state pays 90 per cent of the cost and the beneficiaries pay the rest. According to MGNREGA, the cost of construction of a farm pond is between Rs 35,000 and Rs 5 lakh. Similar is the case with Maharashtra where the subsidy for farmers to dig farm ponds under the state government’s Magel Tyala Shettal scheme was reduced from Rs 80,000 in 2010 to Rs 50,000 in 2016. Ramesh Devidas Kale, Deputy Collector, Employment Guarantee Scheme, Amravati district, says farmers are not happy with the reduction in subsidy. In Uttar Pradesh too the beneficiaries have to contribute around 50 per cent under the Khet Talab Yojana in drought-hit Bundelkhand. Apart from this, the farmers have to pay 3 per cent of treasury charges. The total cost of each pond comes to around R1 lakh. This is too much for farmers to bear. “Families are struggling to get food. How can we pay such a huge amount for ponds?’’ says Kishan Dut, a farmer in Ganj village of Mahoba district, Uttar Pradesh. Sachin Chowdhry, associate professor, Indian Institute of Public Administration, New Delhi, says that when governments start chasing targets mindlessly, it becomes an exercise in vain. During his visits to rural areas of Rajasthan in 2011-12, he found that most of the ponds and trenches constructed under MGNREGA were of no use and had been abandoned. “Farm ponds can meet the same fate,’’ he warns. The story has been taken from the September 16-30 edition of Down To Earth magazine.